Swansea City manager Garry Monk will hold talks with forward Michu, currently on a season-long loan at Napoli, about his future at the end of the campaign. 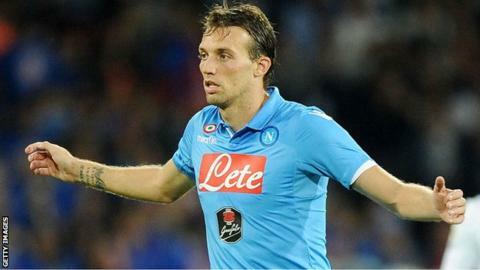 Michu, 29, joined Italian side Napoli in July but injuries have limited him to just five appearances so far. The Spain international has a year left on his Swansea contract, and Monk hopes to resolve his future. "I'll assess it in the summer with him. I'll speak to him," said Monk. "I've kept an eye on how he's doing and, as a club, it's our duty to make sure we understand exactly what's going on with Michu. "I'll just let him worry about his football and, at the end of the season, we'll sit down and see where we go forward from there." Michu joined Swansea from Rayo Vallecano for £2m in 2012 and enjoyed a spectacular first season at the Liberty Stadium, scoring 22 goals in all competitions. He signed a new contract in January 2013, keeping him in south Wales until 2016. But his second campaign was blighted by an ankle injury which has continued to hamper him this season in Italy. "He's a Swansea City player, he's still contracted to the club," added Monk. "I had good discussions with him in the summer and he's gone to Napoli on a season's loan. He's been injured and he's had a difficult time.